Shows and Entertainment There are currently two shows at The MGM Cirque de Soleil’s KA and Crazy Horse Paris (over 18 only). The Hollywood theatre is used to host headliners it was Tom Jones on our last visit David Copperfield is there as I type. 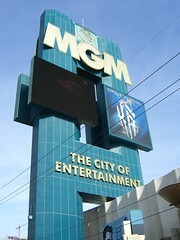 The MGM Grand Garden Arena is one of the biggest venues in Vegas and is used for concerts and boxing. 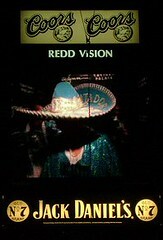 MGM has a good selection of good bars added to Studio 54 nightclub and the Tabu ultra lounge if you wanted to you need not go anywhere else for your entertainment. MGM is also home to MGM GRand Arena this is one of the premier venues in Las Vegas it plays host to the biggest boxing events in the US such as Ricky Hatton, De La Hoya and Mayweather and holds concerts such as Maddonna, Billy Joel and Britney. MGM I feel also has the best selection of non Ultra lounges and the best bars on the Strip its great for relaxing drinks in a non club enviroment. Dining MGM is great for dining , the Grand Buffet (B$13.99, $15.49 D$25.99 and Champagne Brunch $20.48 or $18.99 without the champagne) this is a good buffet its not a contender for the best buffet crown but its good and good value, be warned that the queues can be long and the “champagne” on the brunch is not that hot but for $2.50 unlimited who can complain ! There is a good food court for quick eating including, Nathan’s Hotdogs, a pizza place and Haagen Daz’s. The 24hr coffee shop is big and can take a while for food to be served and sometimes is not as hot as it should be. The rainforest café is a good bet for younger diners with animated robot animals and thunder storms. MGM has 8 offerings in the fine dining class Nob Hill, Pearl, Joel Robuchan, L’Atelier, Craftsteak, Fiamma, Sea Blue and Fiamma. 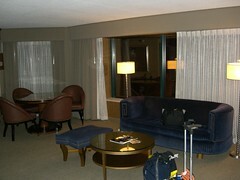 There are 4 casual restaurants the very good Wolfgand Puck café, The grand Wok, Emeril’s and The Grand Wok. The MGM also has the obligatory 24 hour Starbucks. Ricky Hatton coasted to a one-sided win over Paulie Malignaggi at the MGM Grand in Las Vegas, with his opponent’s corner stopping the fight in round 11. Malignaggi had occasional success with his jab but fought virtually one-handed for much of the fight and lacked power. Manchester’s Hatton had Malignaggi in trouble with some savage left hooks, and overhand rights.Going into the 11th, Malignaggi was behind on all three scorecards, causing his corner to throw in the towel. Hatton joined up with new trainer Floyd Mayweather Sr just seven weeks ago, but there were signs of real improvement following some worrying recent performances, as Hatton promised there would be. 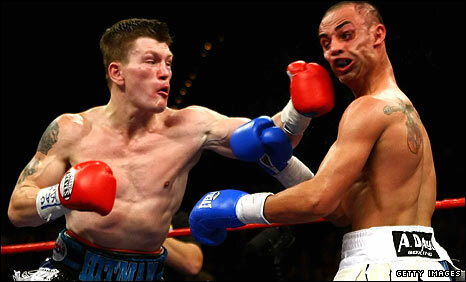 Hatton, 30, improves to 45 wins (32 KOs) and one defeat, while Malignaggi falls to 25 wins (five KOs) and two defeats. While the Grand Garden Arena was by no means full, most of the estimated 9,053 in attendance were supporting Hatton. Hatton, wearing a fat suit, was accompanied to the ring by Oasis’ Gallagher brothers, who were charged with carrying their fellow Manchester City fan’s belts. Hatton suffered his only defeat as a professional at the same venue last December, when he was stopped in 10 rounds by Floyd Mayweather Jr, making his victory doubly sweet. “I enjoyed it better than last time I was here, that’s for sure,” said Hatton. “I’ve just come into a new camp and I’ve been working on new things. Floyd and I have been together for seven or eight weeks and it doesn’t happen overnight. The bout might be between a Brit and an American Saturday night at the MGM Grand Garden Arena, but there’s little doubt who the raucous crowd will stand behind inside the Strip casino come Saturday night. Not so fast with those American flags Paulie Malignaggi, Ricky Hatton has returned to Las Vegas and brought with him another strong contingent of British boxing fans to go along with the American supporters he won over last December. “I think all the fans that have bought tickets that have come over from Britain and the fans from the United States have given us fantastic support,” said Hatton, who sports a 44-1 career mark, with his lone loss coming at the hands of Floyd Mayweather Jr., last winter. The Hatton camp knows that the infusion of Brits who came over for the Hatton-Mayweather fight will not be topped, but it is are hopeful somewhere around 8,000 members of the “Hitman’s” army will attend the 12-round title fight. “British fans are generally known for that, but Ricky Hatton fans can be a little on the noisy side,” said a smiling Hatton, about his enormous support. That’s why after his loss to Mayweather Jr., and lackluster showing against Juan Lazcano in front of some 50,000 of his countrymen in Manchester, England, Hatton new a change was needed. He switched trainers from Billy Graham, the only teacher he’d ever had, to Floyd Mayweather Sr., the father of the only fighter to ever beat him. “I’m not going to change my style, I’ve worked too long,” Hatton said. 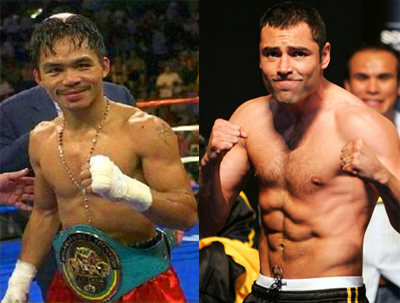 “I think that Floyd’s polished me up in certain areas, though. Hatton’s brother, Matthew, said he’s seen the new-found determination on his brother’s face. “It’s been a different training camp. I’ve seen a big improvement in him,” said Matthew, who shared the long runs up Mount Charleston with his brother during their long training camp in Las Vegas.